What Is Warehouse Temperature Stratification? 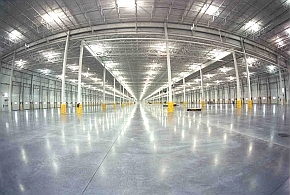 In addition to a building envelope’s affect on energy conservation, a great challenge to efficiently heating warehouse environments is relative to temperature stratification (the temperature at the ceiling deck versus the floor). 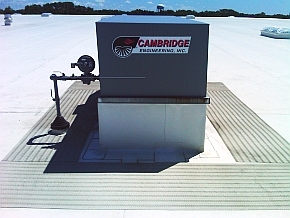 We have always looked to properly size our HVAC equipment to their respective clear height environments and have recently installed Cambridge heating units in our 30’ clear ht. warehouses. The units directly pull 100% outdoor air and push high temperature, high velocity air downward in three directions effectively reducing temperature stratification. Business owners operating in large footprint buildings with high clear height warehouse environments not using Cambridge or Johnson air rotation units are likely experiencing 85 degree temperatures at the ceiling and 65 degree temperatures at floor level with equipment that cannot keep up with the demand during our winters. Temperature stratification costs business’s money, makes undersized equipment work harder, and reduces air circulation benefits to employees. We also actively participate with our tenants in public utility incentive programs to replace older equipment with newer, more energy efficient equipment.